Bluetooth. Hands free. I’m drunk. I really don't know why this keeps coming up. Profile or Odyssey Thunderbolts have been the standard by which all others are judged. Yeah there are, certainly, other worthy cranks. But, in general, this has been some of the most consistent facts in BMX for years. I’m all for thunderbolts. Although I have broken a pair. What I was doing was nuts but they didn’t snap. It was afterwards that they actually failed and when I noticed that I cracked them. Currently I’m running Fit indent 24mm cranks. Only because odyssey cranks were stolen. Odyssey warrenteed my cranks when I broke them on the road and it was no hassle spite traveling nonstop. I just bought new cranks a couple weeks ago. 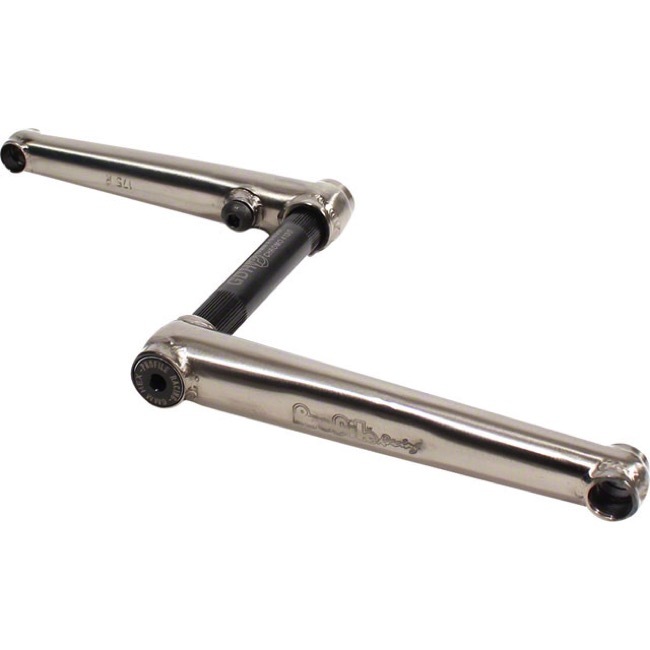 I always wanted Akimbo's, but then noticed Madera Bantam cranks had the same lifetime warranty + USA... Was still unsure which one I wanted. Deciding between Akimbo, Bantam, Rig and Thunderbolt cranks was difficult, but the added Never-Wobble™ guarantee is what ultimately made me go with Thunderbolts. Been riding the Thunderbolts for the past 2 weeks and I really enjoy the quality and ease of installation/ removal of them. I'm about 260lbs and these cranks feel absolutely solid. Also, having only (2) 6mm bolts vs. the (5) 6mm bolts + (2) 8mm bolts of my Powerbites have been a nice change. Been riding BSD substance cranks for 2 years. Haven't touched them since original installation. 0 wobble 0 loose bolts. Been great. Got some Substance XLs on my DJbike and they too have been close to perfection. Stiff strong and smooth. Have also been trying some Federal Vice 24mm cranks (shorter length than my BSDs) and they've also been super sturdy and stiff. I don't take anything off massive drops or silly slams but I ride at least 10 miles every day rain, snow or shine and they have all been Sweet. Just me or is that a crack on the sprocket boss? Also, no pedal threads? Uh, what? I been riding the fit indent 24 mm bossless cranks for a year. They are Super stiff, strong, don't feel like they bend or flex when jumping. I ride 165 mm length. I recommend these. I use to ride the profile 19 mm spindle cranks and they always felt they were flexing. Never broke them though or cracked them and rode those for about five years. I have Fit 24mm Indents, and Odyssey Calibur's. Of the two I prefer the Odyssey Caliburs, as they actually feel a little lower profile between my ankles. I also would prefer a fine thread sprocket bolt boss....like profie uses. I can get the finer threads much tighter before the allan bolt hole rounds out. Do the Thunderbolts use a fine-thread sprocket bolt? Thunderbolts have a slightly finer bolt than Profiles(who use 3/8x24TPI), at 10x1mm(roughly 3/8x25.5TPI) but the difference is really not noticeable. I believe so. I was unable to reuse the sprocket bolt from my Powerbites (bolt was too tight). Tibia Éclat. I still have the first versions when I got them in 2010 and running strong. I ride pretty hard. Big bowls, big trails, and a little bit of street. I e modified mine a fair bit and ive still had no problems othr than needing a little bit of loctite on left arm to tighten the litte wobble from years of abuse. Not to mention I rawed them on day one. I’m only waiting for the 10 year anniversary cranks to ha e a clean new set. Otherwise I’d still run the same ones for ever ? Fit indents are where it's at. I still miss my cult deathrows though. Those were solid, made by solid. Solid. I'm wondering why Primo Powerbites haven't been mentioned. I just got on some Kink Pillar 22s and they’re dope. Best part is they’re lighter than all other similar cranks while having an added "pillar" for support. I’m still new on them so Time will have to tell. I do recommend them if anyone is looking for some new cranks.